When thinking of a cat, all the fundamental feline features most likely come to mind. First, your brain conjures up the standard silhouette of a kitty cat featuring pointy ears, a long tail and large penetrating eyes which are all typical characteristics. So as long as there's an ear headband on your head and a long tail pinned on your back, people will know you're disguised as a feline. However, if you want to spice things up a bit the cat eyelash, nail, and glitter kit is a must-have. The kit comes with everything needed to add some sparkle to a cat costume of any variety. From panther to tiger to domesticated house cat, this kit will serve as the cherry on top. Or is catnip on top a more appropriate reference? You'll receive 10 black almond-shaped nails with a rhinestone and a streak of silver sparkle. 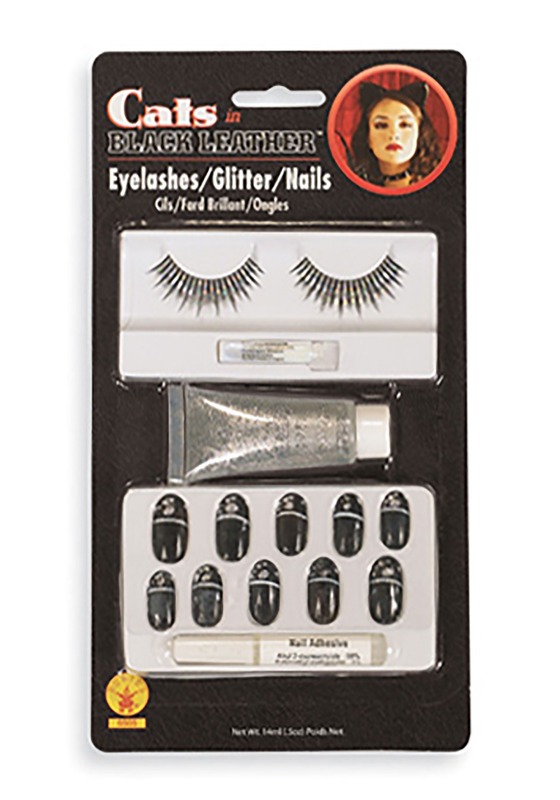 The eyelashes also feature silver streaks in between each black synthetic eyelash. You'll also get nail adhesive and eyelash glue with application and removal instructions. A tube of silver glitter makeup completes the kit to add an extra splash of sparkle because you can never have enough. Now all you have left to do is bat your eyelashes and flex your new claws. Oh, and swinging your tail wouldn't hurt either.